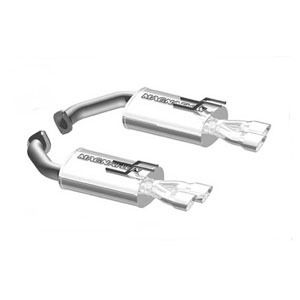 Magnaflow Axle-Back Exhaust System for Pontiac G8 Available! The Magnaflow Axle-Back Exhaust System for the Pontiac G8 are 100% polished stainless steel and lap-joint welded for solid construction and rugged reliability even in the most extreme conditions. They feature a free-flowing, straight-through perforated stainless steel core, stainless mesh wrap and acoustical fiber fill to deliver that smooth, deep tone. Mufflers are packed tight with this acoustical material unlike some others; products to ensure long life and no sound degradation over time. Backed by a Lifetime Warranty. Pontiac G8 Magnacharger TVS1900 Kit Now Available! The Pontiac G8 Magnacharger TVS1900 Kit includes a 6th Generation “State of the Art” Magnuson Model MP1900 supercharger and is the basis for the new G8 Magnacharger kit. It was designed as a compact, flexible supercharger for increased power with original equipment quietness and reliability without adversely affecting fuel economy. The MP1900 6th Generation has proven itself in a number of original equipment and aftermarket applications on a variety of engine sizes. This version has taken this versatility to the next level with new 4-lobe, high helix rotor design and a built in bypass for unparalleled performance. SLP G8 1.85:1 Rocker Arm Set Now Available! INTENSE is proud to offer the SLP Rocker-Arm Package, L76/L92/LS3 Aluminum Off-Set (1.85 ratio) for 2007-08 Chevrolet/GMC Truck and SUV’s L76/L92, 2008 Corvette L92/LS3 and 2008 Pontiac G8 L76/L92. Designed as a true bolt-on replacement for the stock rocker arms, these easy-to-install rocker arms require no modifications. Our exclusive 1.85 ratio design is based off the stock rocker arm design providing OEM-quality aluminum construction and a roller bearing trunion which results in a 10% increase in valve lift over the stock 1.7 ratio rocker arms and gains of up to 12 HP over stock. 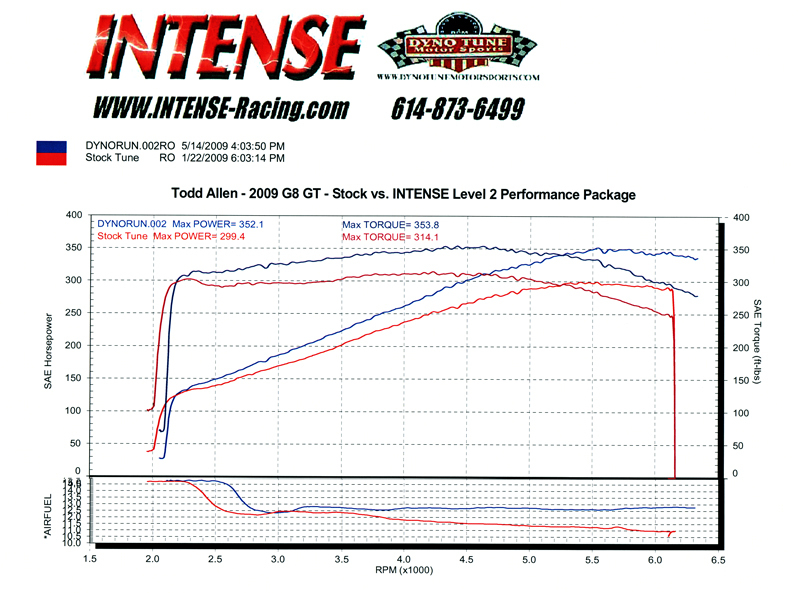 INTENSE G8 Level 2 Performance Package! We added SLP Headers and a 2.5″ exhaust system to our already popular INTENSE G8 Level 1 Performance Package to create the INTENSE G8 Level 2 Performance Package. The results over stock are pretty impressive as the graph below shows.